Talk about two for the price of one! 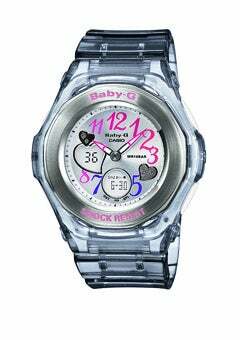 Baby-G has debuted an innovative new watch which offers you both modern digital and traditional analog tie keeping. To keep things colorful, the dial features over-sized numbers in bold pinks, purples, blues and greens. It comes in three styles: black resin, white resin and our favorite, the transparent grey resin. The watches just debuted on the market this month and you can find them now at stores like Nordstrom, Macy's and Baby-G online for $99. Talk about two for the price of one! 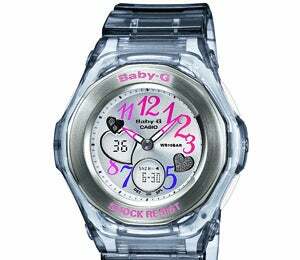 Baby-G has debuted an innovative new watch which offers you both modern digital and traditional analog tie keeping. To keep things colorful, the dial features over-sized numbers in bold pinks, purples, blues and greens. It comes in three styles: black resin, white resin and our favorite, the transparent grey resin. The watches just debuted on the market this month and you can find them now at stores like Nordstrom, Macy’s and Baby-G online for $99.